Posted on March 19, 2019 at 10:10 am. A pre-existing condition is a health problem you have before the new insurance policy plan starts. What are Medicare Supplement plans pre-existing conditions? It depends on the time of enrollment in the Medicare Supplement (Medigap) plan. Consider three different scenarios: Medicare Supplement Open Enrollment Period, Guaranteed Issue Right, and Medical Underwriting. The company cannot make you wait for your coverage, but they may make you wait for coverage related to a pre-existing condition. The company may use the pre-existing condition waiting period that cannot exceed 6 months. After 6 months, the Medicare Supplement plan must cover any pre-existing condition. The company may use a waiting period ONLY if the condition was treated or diagnosed within 6 months before the Medigap coverage starts. In certain situations, known as Guaranteed Issue Rights, you are entitled by law to buy a Medigap policy without medical underwriting, i.e., without having to answer any health questions. The pre-existing condition constraint is also not available; there is NO waiting period for coverage of pre-existing conditions. If you are applying for a Medicare Supplement policy after your Open Enrollment Period and do not have Guaranteed Issue Rights, the insurance company is allowed to use medical underwriting to decide whether to accept your application, to charge more for the plan, or to impose its regular (up to six months) pre-existing conditions waiting period. If you switch from one Medigap policy to another Medigap policy with the same benefits, the insurance company cannot exclude your preexisting conditions if you had 6 months or more coverage with the previous company. But if the new policy has a benefit that is NOT in your current Medigap policy, then you may wait up to 6 months before that benefit will be covered, regardless of how long you had your current policy. Choosing a Medigap Policy: A Guide to Health Insurance for People with Medicare. 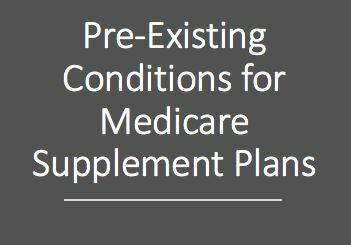 What do you think about Do Medicare Supplement plans have Pre-existing Conditions? Write your comments. For help finding whether you have Pre-existing Conditions for Medicare Supplement, please contact Liberty Medicare or call us at 877-657-7477.